Rockstar Games has joined an exclusive club after receiving the BAFTA Fellowship award. 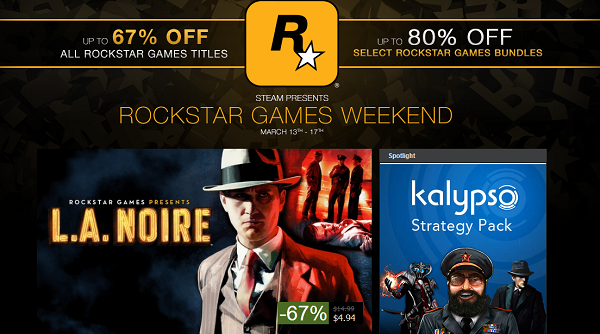 Steam appears to be celebrating this by holding a Rockstar weekend, with massive discounts on all Rockstar titles. Sadly, Grand Theft Auto V has not made it to the PC in time for this sale. Aside from the most recent game, there is the chance to pick up the Grand Theft Auto complete pack which includes GTA III, GTA IV, GTA: Episodes from Liberty City, GTA: San Andreas, and GTA: Vice City; all for only US$9.99. In fact, every GTA game on Steam is currently going for about 75% off; which makes this a great time to catch up on why Rockstar deserved to win such a prestigious award. Aside from that, there are a couple of Max Payne Bundles and an L.A Noir bundle; both for 75% off the regular price. The ultra violent Manhunt along with Bully: Scholarship Edition; so there is an outlet for your (even) more outrageous sociopathic tendencies. The sale runs until 17 March, so there is time to settle down and decide which laws you would like to virtually break. For those less prone to antisocial behaviour (or require a larger scale), Steam also has a Calypso sale going on. These titles include the outrageous Tropico series, Port Royale 3, and a Jagged Alliance collectors bundle.